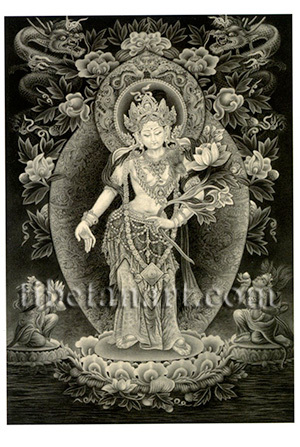 This exquisite chiaroscuro painting of Padmapani Lokeshvara, the bodhisattva of compassion, was the last painting made by the great Newar artist, Siddhimuni Shakya. This monochrome painting has been rendered through a very subtle technique of ink shading, where all the luminous highlights are actually formed from the white paper that it is painted upon. White Padmapani Lokeshvara stands gracefully upon a moon disc and a lotus that floats above a rippling lake. He is peaceful, serene, dignified and beautiful; his right hand reaches downward in the boon-granting varada-mudra of supreme generosity, and with his left hand he holds the thick stem of a white lotus at the level of his hip. He is adorned with the five divine silk garments and the eight jewel ornaments of a bodhisattva, an antelope-skin is draped over his left shoulder, and a serpent adorns his breast as a sacred thread. Amitabha Buddha is seated at the centre of his magnificent crown, and his ornate halo is adorned with two crocodiles or makaras with small figures in their jaws, and the crowning serpent-devouring head of kirtimukha. Two writhing dragons emerge from the darkness of the upper sky, and Lokeshvara's ornate aura is wreathed with a profusion of lotus flowers, leaves, tendrils, fruit and seed heads. Upon a floating lotus and moon disc in the bottom left corner kneels the radiant and beautiful white bodhisattva Lutavaha, who offers a lotus to Lokeshvara with pure adoration. Upon a similar moon disc and lotus in the bottom right corner kneels the semi-wrathful form of the wealth god Ranikunda, who holds a tray of jewels with his left hand, while he offers a wish-granting gem with his right hand. This beautiful painting is rendered in such a way that the light emanating from Lokeshvara's divine form appears to illuminate all the components of the background landscape.